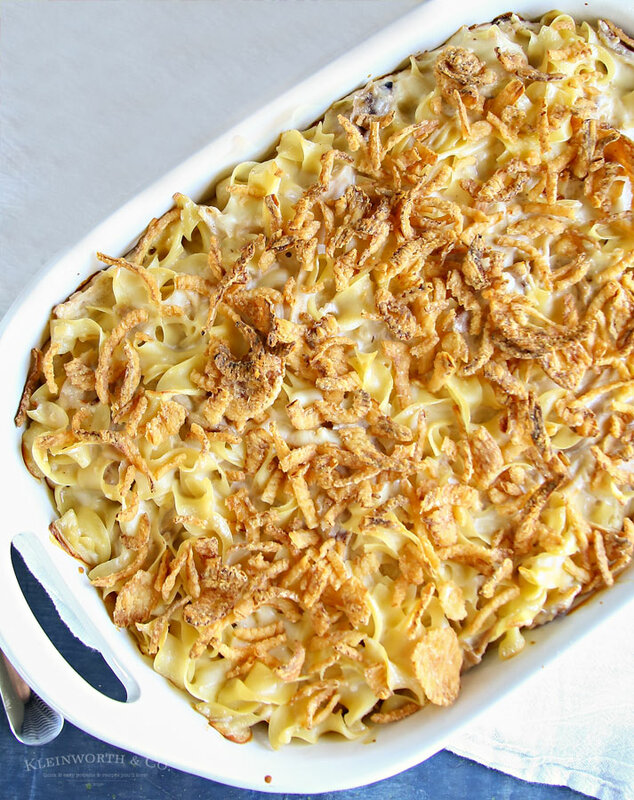 French Onion Chicken Noodle Casserole is an easy family dinner idea that everyone loves. Simple to make with rotisserie chicken & egg noodles. Delicious! I sure love quick & easy dinner recipes. Seems the older the kids get the busier we are. 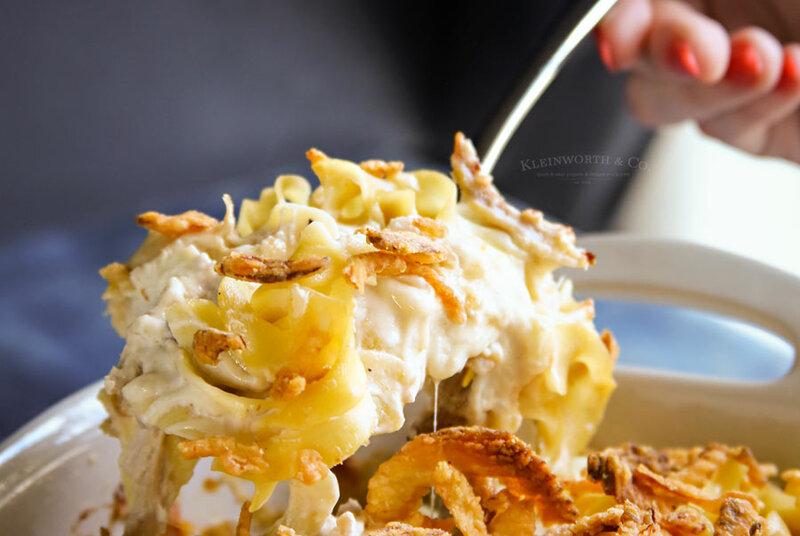 It’s hard enough to get everyone at the table at the same time between work & school schedules, so when I can create a super quick dinner, like this French Onion Chicken Noodle Casserole, that the whole family loves that is a WIN. Anything I can do to maximize our time together as a family is a bonus for us all. We started with No Yolks egg noodles for this super easy recipe. We always keep them on hand for quick dinners that everyone loves. 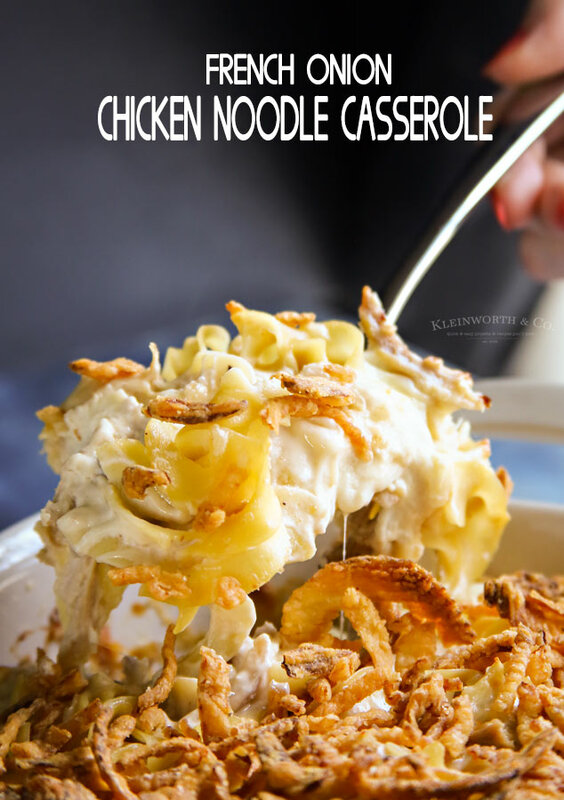 You just can’t go wrong with these when making a super yummy dish like this French onion chicken noodle casserole. They are so versatile, we use them in casseroles, soups, salads & more. No Yolks is a healthy egg noodle alternative, made from egg whites and no cholesterol, and are low in fat and sodium. So thick & creamy with that great flavor of French Onion- the family requests this one again & again. I remember as a kid craving casseroles when the weather got chilly. Something about a warm & cozy home & delicious comfort food like this just makes the season so inviting. I really love it when we have the fire going during dinner too. 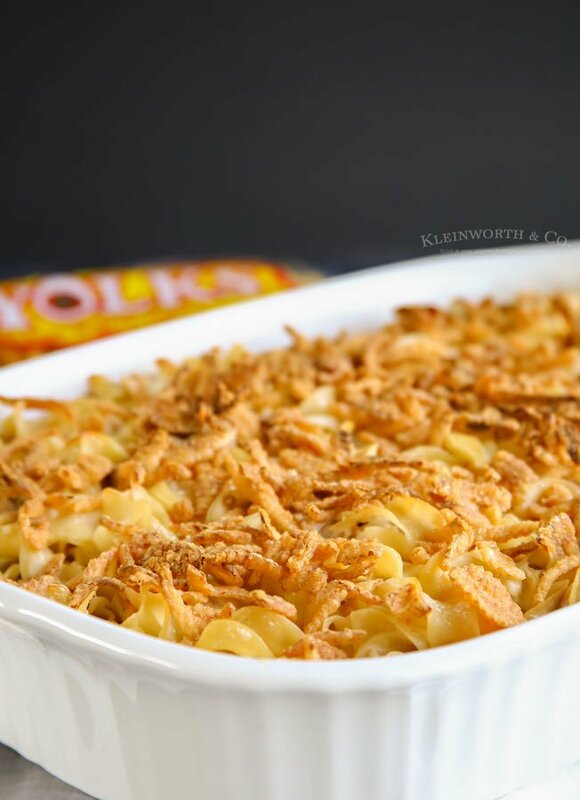 Chicken, cheese, creamy goodness mixed with noodles & topped with crunchy fried onions. YUUUMMM! This recipe works great for leftover chicken when we have made tacos the night before. But there are times when I pick up several rotisserie chickens, pull off all the meat & freeze it in a bag. Then when I need a fast dinner I can just pull it out, microwave for about a minute & mix it into my dish. Works great for casseroles & soups too, but this is by far my favorite. 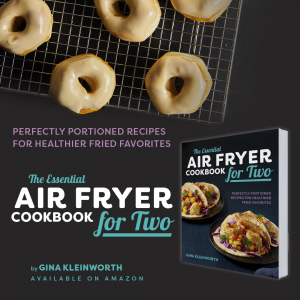 Find No Yolks in a variety of cuts for all types of recipes including Broad, Extra Broad, Fine, Kluski, Dumplings, and now Stir-Fry. Don’t you just want to dive right in? It’s the perfect dinner for busy nights. There is something so comforting about french onions! Your casserole looks delicious, I just pinned to try later! Thanks so much for sharing with us at Full Plate Thursday. Have a great week and come back to see us real soon! Yum, Gina!! This is going on my must make list, and to the top! Thanks for sharing with #HomeMattersParty! Oh this looks yummy! Pinned! Thank you for sharing on Merry Monday! Hope to see ya next week! Hey, Gina! 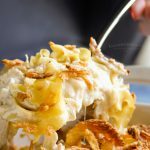 Just wanted to let you know that we loved your French Onion Chicken Noodle Casserole so much when you shared it at the #HomeMattersParty last week, we’ve FEATURED it THIS WEEK! Hope you can check it out when you get a sec. Happy Friday!!! Thank you so much for sharing my recipe! Hope you have a wonderful weekend! Great casserole. We loved it. We will certainly make it again.